Here is a picture of the former manager of the musical group Barikad Crew, Youri Chevry. In this picture, he is seen with Anick Francois, He was installed as the new mayor of Port-au-Prince. Youri Chevry does understand that the job of a mayor, specially that of a mayor of Port-au-Prince is extremely difficult. 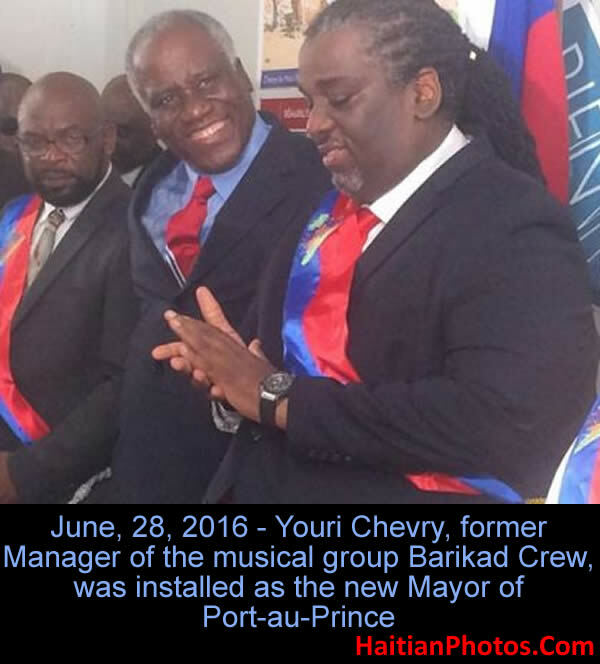 On June 28, 2016, Youri Chevry (born October 14, 1967), the former manager of the musical group Barikad Crew has been installed as the new Mayor of the capital city, Port-au-Prince. For those, who wanted to know whether he would continue with his band 'Barikad Crew', Sassoune, the person closest to him said, as the present mayor of Port-au-Prince, he has relinquished his management duties, but would continue his association with the band. In the late 1980's, Youri went to Brooklyn to study management and sound engineering. He came to the musical arena much before the Gracia Delva era. In 2003, he joined Konpa Factory, Inc. as a director. The company was responsible for booking and promoting Bel Jazz in Haiti. Youri lost his wife and 11-year-old daughter in the 2010 earthquake. In last October, when he was campaigning as a candidate for mayor of Port-au-Prince under LAPEH banner, Yuri with his Jeans, loose shirt sleeves looked much different from his other contenders in the political race. He talked in a calm, little hesitant way about his plan for the youths and the capital city. As the new mayor, he has promised to make Port-au-Prince a clean city, the safety and security of every citizen will be ensured with the support of PNH and MINUSTAH. The municipal administration will work to encourage and stimulate the return of businesses in the downtown Port-au-Prince. Here is a picture of Haiti Verification Commission. On April 28, 2016, an Independent Commission for Electoral Evaluation and Verification (CIEVE) was installed by the Provisional President Privert. 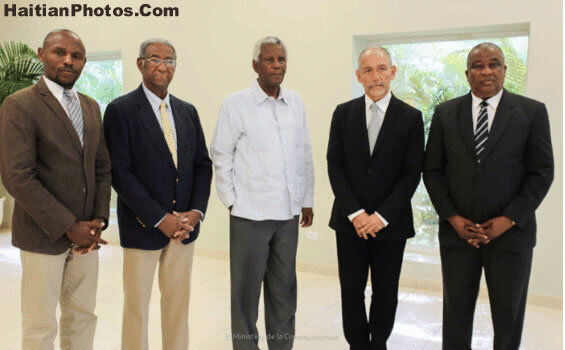 The five members of the Commission included: (1) Mr. François Benoît, the leader, and former member of the Provisional Electoral Council (2005-2006); (2) Mr. Gédéon Jean, former member of the Independent Electoral Evaluation Commission created by presidential decree dated December 22, 2015 (under the Martelly regime); (3) Mr. Pierre Wilfrid Sanon, designated by the Haitian Association of construction companies; (4) Father McDonald Jean, appointed by the Anglican Church (former senator and member of the Council of the Wise in 2004); and (5) Mr. Michel Eric Gaillard, designated by the Order of Chartered Professional Accountants of Haiti. The primary objective of creating this Commission was to establish credibility of the 2015 election results and restore confidence and encourage participating players to trust the electoral council and to participate in the upcoming elections. However, the report submitted by the Commission on May 30, 2016, suggests that the first round of presidential elections held on October 25, 2015 was marred by massive frauds and that was to such an extent from higher administrative levels that the Commission has recommended rejecting the disputed results, and start re-poll from the beginning. Here is a picture of Note de press from CSPJ President Jules Cantage. 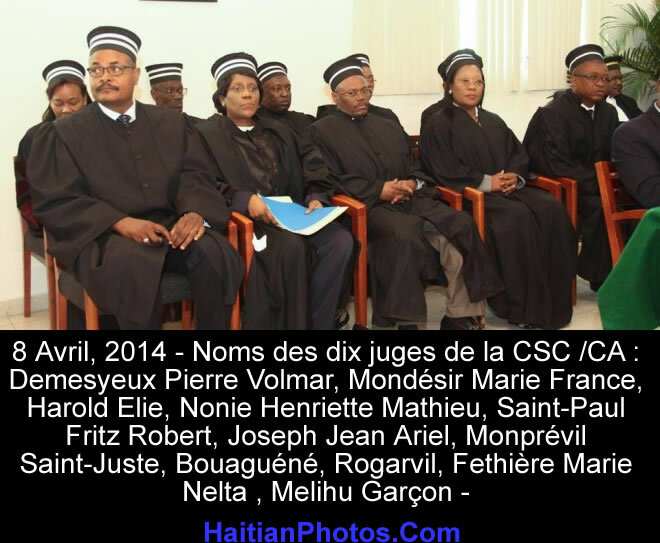 On Friday, May 27, 2016, by a presidential decree, Jean Danton Léger, the Government Commissioner of the Court of First Instance (CFI) in Port-au-Prince, has been appointed as the new representative of the floors to the Superior Council of the Judiciary (CSPJ). The news of Danton's nomination as a new advisor was not communicated to the President of CSPJ Jules Cantave officially; the President of CSPJ learned about Danton's appointment from the media. The news came to the Judiciary President Cantave as a surprise and he felt stupefied. 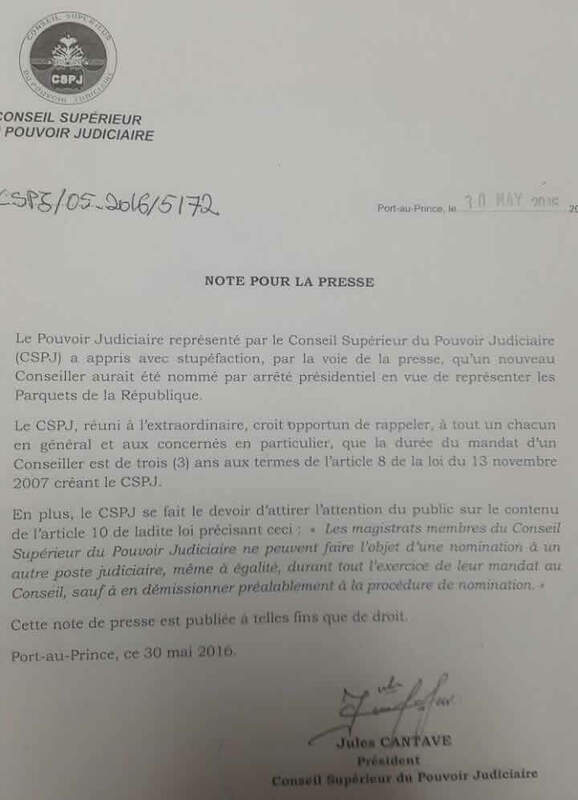 The President of the judiciary felt irritated and reported the press that the decision of the Provisional President Jocelerme Privert overriding the judiciary is illegal. The term of a CSPJ member is for 3 years and such member cannot hold any other post, anywhere else during his/her tenure with the CSPJ. Dominican Company took $10 million to build the Parliament building. When in March 2012 then president Martelly visited the Dominican Republic, he was awarded the country's highest honor for a foreign Head of State, mainly for his effort to lure investment in the reconstruction of earthquake torn Haiti. 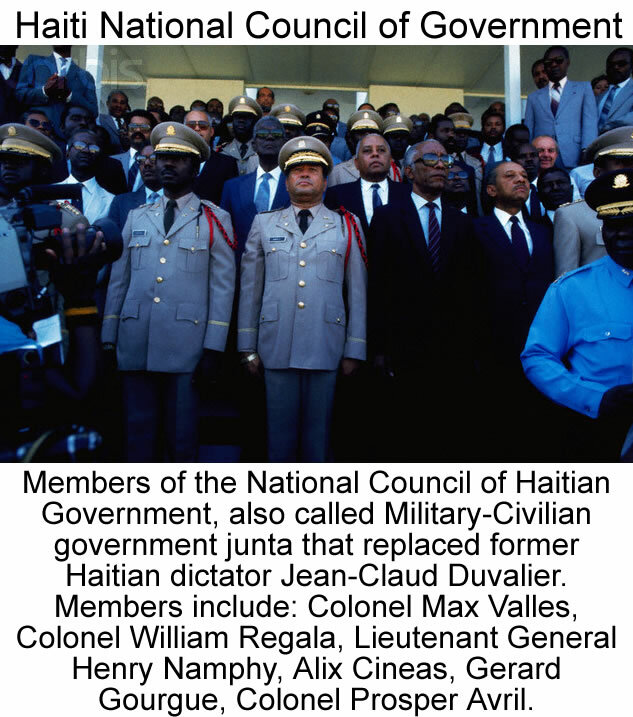 However, according to an explosive March 31, 2012, report by star Dominican journalist Nuria Piera, Martelly as a candidate, president-elect, and president of Haiti, received bribe close to $2.6 million in over a dozen payments from a Dominican Senator named Félix Ramon Bautista. The payment came from the bank accounts of two Bautista-owned firms and in return, three Dominican companies, connected to Senator Bautista, received Haitian government contracts totaling $343.32 million. Senator Bautista Rosario was also the secretary of the ruling Dominican Liberation Party (PLD). 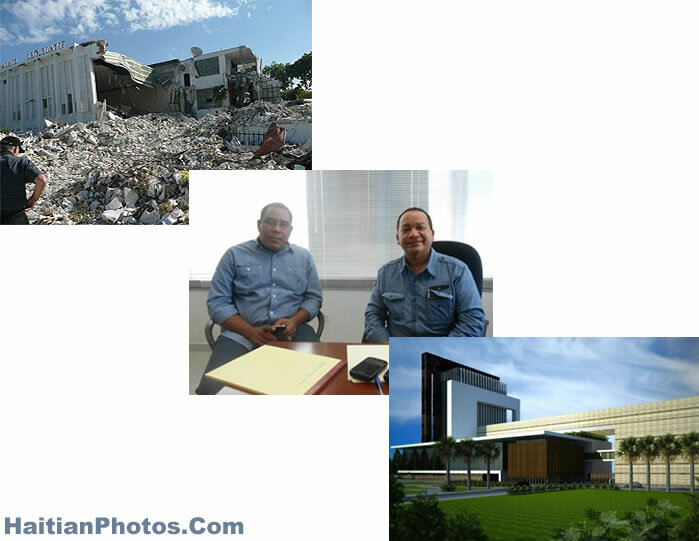 Those contracts were: (1) Constructora Hadom (98% owned by Bautista) won the contract to rebuild Haiti's Parliament Building, destroyed in the Jan. 12, 2010 earthquake, for $33.77 million; (2) Constructora Rofi S.A. was awarded to build a new housing development at Fort National for $174.31 million; and (3) Construcciones y Diseños R.M.N. S.A., won $135.31 million contract to build another housing development in Bowen Field. 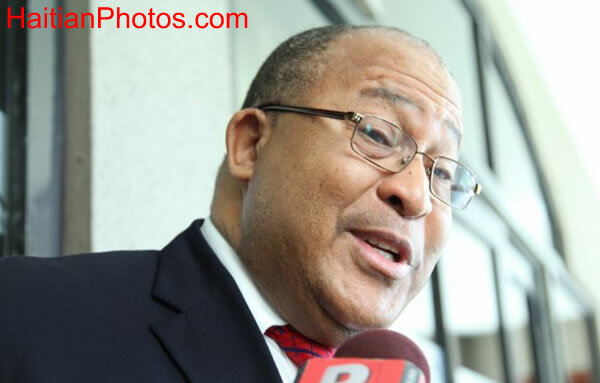 A closed bid with three companies belonging to the same person is horrendous and when these deals finalized by the former Prime Minister Jean-Max Bellerive on November 8, 2010, became the target of an audit by the succeeding Prime Minister Garry Conille, he was forced to resign. Since receiving the advance of $10 million, there is no trace of Constructora Hadom. A recent spot investigation made by UCLPB concludes that it was a total waste of money as nothing has been done for the amount disbursed so far. Here is the meeting conducted to finalize the terms for the creation of the Commission of Verification. Present at the meeting was President Jocelerme Privert, PM Enex Jean-Charles and others. As per news reports dated 17 April, 2016, the terms of reference of the Independent Commission of Electoral Evaluation and Verification were submitted to the Interim President Jocelerme Privert for validation purpose. On the same day, these terms of references were discussed, approved and signed by the representatives of more than a dozen of political parties after several hours of discussions on the work of this Commission. Some of the important terms of reference which were approved include: (a) development of a methodology for a technical analysis of the data; (b) purify the voting process by analyzing the signing and counting sheets, partial electoral lists, ballots, minutes of counting, minutes of deficiency and incidence minutes; (c) evaluation of registered complaints; (d) compliance of voting and counting processes; and (e) identify the perpetrators, beneficiaries and victims of serious irregularities or frauds. Jocelerme Privert Vs The Haitian Parliament. On 14 February 2016, the Haitian parliament elected Jocelerme Privert as the interim leader, the provisional President to lead the country until the next presidential polls. 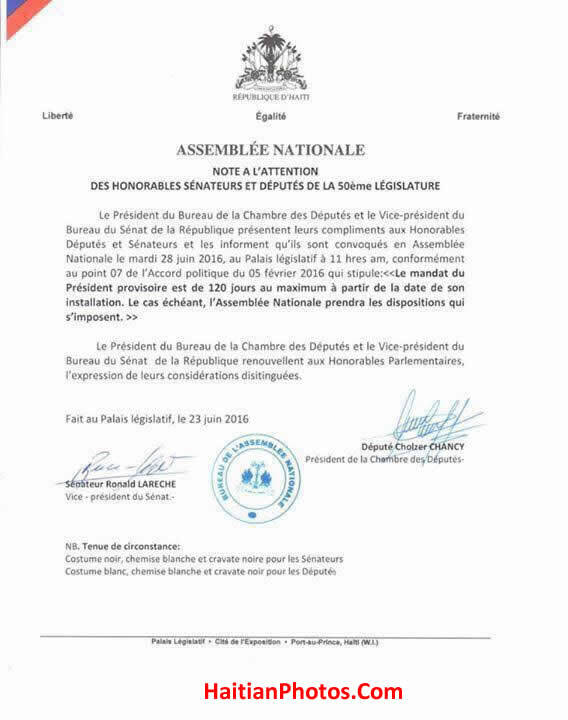 The Haitian lawmakers chose the country's former Senate chief Jocelerme Privert who would lead a caretaker government as the interim provisional president with missions to ease the tensions of the suspended elections and hold the overdue presidential election on April 24, 2016 and install a new President on May 14, 2016-- all within his 120-day tenure. However, Privert in spite of being an experienced politician and good administrator, could not organize the election as per his given mandate. He has told the press that he would publish a new election calendar by the end of May. He has also mentioned, political stability, proper infrastructure and arrangement of election funds are some of the prerequisites to hold a credible election. Here is a picture of the members of the Superior Court of Auditors and Administrative Disputes - 2014. In September, 2014, the Superior Court of Auditors and Administrative Disputes (CSC/CA) signed a Memorandum of Understanding with United Nations Development Program (UNDP) for implementing steps to strengthen its capacity and scope of operation. As per the plan, the UNDP would provide its expertise to evaluate the efficiency of CSC/CA's institutional organism and provide mechanisms for improvement of administrative and financial control. The Superior Court of Auditors and Administrative Disputes (CSC/CA) is a capital institution responsible for strengthening of good governance, oversee the actions and management of public administration and public funds, and assist the parliament and the executive in the control of enforcement of laws and regulations regarding the budget and Public accounts. On Monday, March 28, 2016, in the salons of the Chancellery in Musseau, Pierrot Delienne, a newcomer to the cabinet has been installed as the new Minister of Foreign Affairs, and also as the Minister of Interior and Territorial Communities (ad interim), replacing the outgoing Chancellor Lener Renauld. Pierrot Delienne was a professor of marketing and program manager at the Haiti Quisqueya University and holds an MBA from the University of Quebec in Montreal (1983), a business administration degree and a law degree from the State University of Haiti. In 2006, he represented as Minister Counsellor in Geneva at the Mission of Haiti to the World Trade Organization (WTO). During his speech for the occasion, the new Chancellor has pledged to make Haitian diplomacy more dynamic and prominent on the international stage. Haiti will be more visible on the international bodies and on the World stages to protect the rights and interests of Haitian nationals living outside and inside the country.